The first step in establishing a discipline program is to understand what discipline is-- and what it isn't. A parent's job is to guide her children through life, teaching them right and wrong. Disciplining a child can take on many forms: time-outs, rewards for positive behavior, or even the removal of privileges. What you use, and what works, is dependent on both your child's age and personality, as well as the situation. You know your toddler's stressors, so trying to avoid them is important. In other words, you can help positive behavior happen, by preventing negative behavior from happening. Don't plan a play date for naptime unless you want a meltdown. Distraction can be a good thing. When your toddler has a meltdown (and she will), try to distract her with something else, such as a favorite toy or activity. This will hopefully stop, or at least shorten, the tantrum from continuing. Do not feed into your toddler's tantrum by becoming upset. This is likely to result your toddler's tantrum continuing. On top of that, you'll likely become too stressed out to deal with it effectively. When your toddler does something that is not appropriate, make eye contact and say 'no,' firmly but calmly. At this point, it is appropriate to use a distraction tool to get your toddler's mind onto something else. Be consistent and clear in your expectations. If something is off limits, make sure it's always off limits, all the time. Likewise, do not reward tantrum behavior. The temptation is to give into your child when he is tantruming to help make the tantrum stop. However, you are inadvertently teaching your toddler that whining and tantruming is a means to get something he wants. 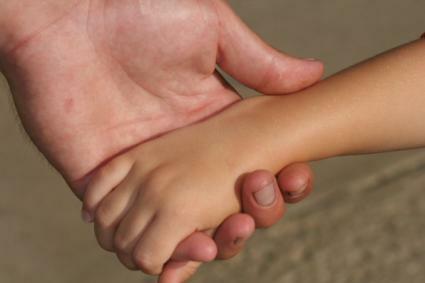 Provide your child with assistance when appropriate, according to Parents Magazine. This will help alleviate any meltdowns; however, you should be sure to allow your child to work to the point just before frustration to help teach independence. Demonstrate what you want your child to do, rather than what he should not do. Show your child how to pick up toys, put clothes in the hamper, or set the table as simple chores. Provide your child with time before transitions occur - let your child know when a transition is about to happen. Set a timer for 5 minutes before changing activities to prevent your child from having any behavioral issues. Set limits and stick to them. Let your child know the expectations, and stick to your guns. If you say, "I'll take your toy away if you don't stop crying in two minutes," then you need to follow through. School-aged children are starting to understand the concept of empathy, or caring about other people. This can huge factor in the discipline process, since children can now understand how their actions are affecting other people. As children approach school age, they begin to develop empathy. In fact, it is not until the child is approximately six or seven years old that she becomes cognitively capable of this concept, according to Sandra Crosser, Ph.D. Talk to your child about how his behaviors might be affecting other people. Ask the question, "How would you feel if someone did that to you?" to facilitate a conversation about right and wrong. Understand the children of this age need to work out differences for themselves from time to time - Your child is getting to an age where he or she can decide who to be friends with, what he or she likes and how to handle conflict. Guide your child in finding the right solution, but let him or her come to the conclusion on his own. Use "time-in" - Schedule time for you and your child to sit down and discuss issues or spend time together. Use this special time to get into your child's world; too often, parents get busy and expect children to come to them with problems. Be proactive and find out what is going on in your child's life; this is likely to prevent many discipline problems. Grounding - something most parents remember from childhood - is still an effective discipline technique today. Dr. Phil recommends only allowing your child access to necessities and temporarily restricting your child to his bedroom for the day or night. This discipline technique helps your school-age child think about his behavior and understand consequences follow when rules are broken. Give your child some space - SuperNanny points out your child will be fighting for his independence. Allow your child to do some things for him or herself to boost self-esteem and give her a sense of freedom. Listen - Many times your tweens actions are trying to tell you something. Use active listening to help understand what your child is trying to tell you. Something may be bothering him or her that he or she does not know how to bring up. Collaborate - Let your tween be a part of the rule-making process. Have your child come up with reasonable rules and consequences if the rule is broken. If your child has a say in what he or she can do, the rule is more likely to be followed. Also, since he or she had a say in the consequence, they are well aware of what to expect. Losing control of yourself is likely to result in an escalation of problems and arguments with your tween. Virginia Williams, Ph.D., points out that effective parenting, especially of tweens, involves not only setting clear limits but also maintaining control of your emotions. This can be especially difficult in the heat of the moment or when you tween has a negative attitude, but it is crucial to effective tween discipline. There are some things that are common to the process of discipline, regardless of the age of your child. The most important aspect of child dislike is consistency. Your child must know from day-to-day that the house rules are always the same. If your child knows that she sometimes gets away with misbehavior, she will continually test her limits. If the rules and routines change periodically with no warning, children become confused and disoriented. Before you can expect your kids to follow the rules, you must be clear on those rules. It is also unrealistic to expect overnight change. If you have had a home free of rules, you can't expect the kids to instantly fall in line just because you say so. Change must be gradual and consistent. Likewise, it is important to avoid too many unnecessary rules all at once. Decide what rules are most important for your home and family and start with those. For many families, the most important rules involve proper treatment of family members. For others, responsibility and chores are top priorities. After you have established your family rules, you must communicate these to your children. Have a family meeting to present your rules and your new child discipline program. If your children are old enough to read, you may want to post the family rules in key places around the house. Again, do not expect instant compliance. Young children have short attention spans and will likely need many reminders before the new behaviors become habits. Remember, there is a huge difference between willful defiance and simply forgetting. Since the primary goal of child discipline is to produce well behaved kids, it is important to "catch" your child doing the right things. Most children instinctively want to please their parents; these kids thrive on praise and parental approval. This is especially true with the parents and children enjoy a close bond. While it is unnecessary to go overboard, a bit of positive reinforcement goes a long way. A simple pat on the back or a hug will likely brighten your child's day. A heartfelt, "Good job!" offers motivation to continue the proper behavior. Even the best parents can make discipline mistakes. Surprisingly, there are common pitfalls that most parents fall into. Fortunately, there are ways to avoid them as well. It can be difficult to hear your child whining, screaming or crying. It seems like the easy way out to just give your child what he or she wants. DON'T! All this teaches your child is that he or she can tantrum for a certain length of time and get his way. As difficult as it is, stick to your guns and don't give in. Eventually your child will understand the limits you are setting and the tantrums will decrease in duration. Keep in mind your child's developmental age when implementing discipline. You cannot expect a 2 year old to be held to the same standards as a 10 year old. While this might seem like common sense, in today's fast-paced world, many parents expect children to meet milestones at a rapid rate. Keep this in mind when choosing discipline techniques. Sometimes children's behavior problems are a cry for help, an indication that something is wrong. Listen to your child to determine what the behavior might be trying to say. Look beyond the behavior and attempt to find the root cause - this may actually end up working for your benefit and ending the behavior all together. Although punishment is part of some parents' discipline regimens, the two words (discipline and punishment) are not synonymous. Punishment, while it may be effective at eliminating a negative behavior, does not teach your child the appropriate way to act. It is entirely possible to guide and train your children without spanking or yelling. This is a difficult concept for some parents to grasp, especially a parent who experience spanking as a child. Spanking is not necessary, and many experts, including Catherine Taylor of Tulane University, agree that it is harmful. In fact, a study done by Murray Straus, co-director of the Family Research Laboratory at the University of New Hampshire-Durhamm, suggests spanking may lead to sexual or mental health problems in the future. There are no hard and fast rules when it comes to discipline. Every child, every parent and every household is different. Take things slow and determine what will work for your family. Utilize outside resources when and if necessary. Behavior charts are a great resource for children of all ages, from toddlers to teens. You can use behavior charts for any type of behavior you want to keep track of, and it will keep your children on track too. Remember, discipline is a process, not an overnight change. If you child has developed bad habits, it may take longer for discipline to take hold. Rest assured, however, the consistency and the methods outlined above give you a great shot at achieving your discipline goals.